Windsor Marquees offers the highest standards in marquee hire in the Gloucester area, priding ourselves on personal service, care and attention to detail. We aim to make your event a perfect and successful event. We specialise in marquees and accessories hiring and our dedicated staff are here to ensure you can relax and enjoy your day, whatever the occasion within Gloucester and its surroundings. When it comes to choosing the right marquee hire Gloucester company to work with, you are going to be looking for the right price, right level of experience and the best customer care, and we are able to meet your requirements on all three of these points, which is why it makes perfect sense to let us handle your marquee hire Gloucestershire needs. No matter how big or small your marquee hire Gloucester requirements are, we have the equipment and team to make sure that your big day is hassle free and a total success, so make sure that you get a quote from Windsor Marquees – one of the most established, experienced and competent marquee hire Gloucester firms you will ever have the pleasure of hiring. Gloucester is home to many things to see and do, with many leading shops and facilities which can allow you to spend a day or a week in the famous city. Gloucester is also home to a very famous structure, Gloucester Cathedral, which boasts Crecy Window, the largest stained glass window in Britain. You can also find the beautiful Victoria Docklands and some small but amazing attractions, with Beatrix Potter’s Tailor of Gloucester being a famous literary link. 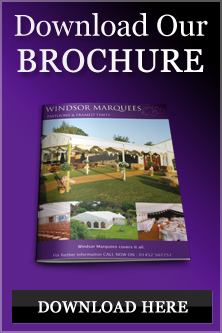 Windsor Marquees have been hiring marquees in Gloucester for around 12 years, serving businesses, leisure facilities, accommodation and entertainment venues with a wide range of marquee and canopy hire. We have catered for many weddings in the area, and also frequently provided marquees for local events, celebrations and business hospitality functions.